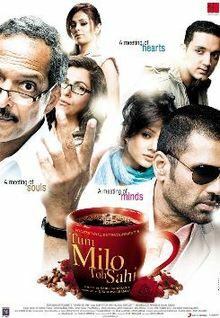 There’s a nice idea at the core of writer-director Kabir Sadanand’s Tum Milo Toh Sahi (“Let’s Meet First,” according to the subtitled translation of the title song’s lyrics). Sadanand wrote a story of six incomplete individuals who find happiness when they work together toward a goal. Unfortunately, he neglected to make any of the characters likable. One of the few people Delshad is kind to is Anita (Vidya Malvade), the miserable wife of a workaholic. When her husband, Amit (Suniel Shetty), complains that Anita is as unhappy in their gorgeous new house as she was in their dumpy one-room apartment, we believe him. Amit works for Blue Bell, a national chain of Starbucks-like coffee houses bent on eradicating the competition. When the company announces a plan to acquire the Lucky Cafe, Amit takes charge of the project in the hopes of paying off Delshad with a minimum of fuss. Delshad refuses to sell, so Blue Bell wages a campaign of corporate terror to force her out of business. Amit participates willingly, at the expense of his marriage. Delshad gets some unexpected assistance from Subramaniam (Nana Patekar), an equally grumpy retired law clerk; Shalini (Anjana Sukhani), a snobby college girl; and Bikramjeet (Rehan Khan), a naive hick. Shalini and Bikramjeet are superfluous characters, but Delshad’s relationship with Subramaniam makes some sense. Both of them missed out on love in their youth because they were focused on their careers and family obligations. Unfortunately, all of the characters exhibit extreme forms of the single traits they are supposed to exemplify. The defining characteristic of Delshad, Amit, Subramaniam and Shalini is that they are all mean. It’s not fun to watch, and it blurs the contrast between the evil corporation and the regular people being trampled on. The regular people need to be virtuous in the face of powerful opposition, not jerks who kind of have it coming. Tum Milo Toh Sahi has a number of other problems. The music is cheesy adult contemporary pop, and there’s too much of it. Every mention of Blue Bell is accompanied an annoying vocal theme, and there are several bland musical montages. The English subtitles are poorly translated. More accurately, they’re poorly transcribed from English to English. Amit, speaking in English, mentions that he’d like a croissant (said with a mild French inflection). Croissant is transcribed as the non-word “crosone” — another reminder that Tum Milo Toh Sahi needed a lot more work and attention to detail before it went to print. This entry was posted in Reviews and tagged 1 Star, 2010, Anjana Sukhani, Bollywood, Dimple Kapadia, Hindi, Indian, Kabir Sadanand, Movie Review, Nana Patekar, Rehan Khan, Suniel Shetty, Tum Milo Toh Sahi, Vidya Malvade on September 23, 2010 by Kathy.